Lacey Point is named for Iowa Congressman John Fletcher Lacey who was an advocate for protection of public lands. The Antiquities Act of 1906 which protected “objects of historic or scientific interest” on Federal Land is often referred to as Lacey’s Act. 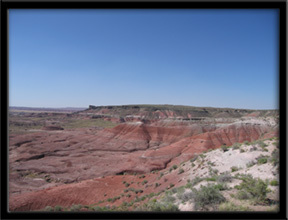 Petrified Forest National Park, then a National Monument was one of the first areas to be protected under this act. The Chinle formation of the Late Triassic here is mostly mudstone and claystone. Notice the striking range of red colors due to the iron present as the Little Colorado River eroded the landscape. The gray colors are harder rock beds made up of siltstone, sandstone and conglomerate. This entry was posted in National Parks, Petrified Forest and tagged Arizona, Lacey Point, Painted Desert, Petrified Forest National Park, scenic overlooks. Bookmark the permalink.